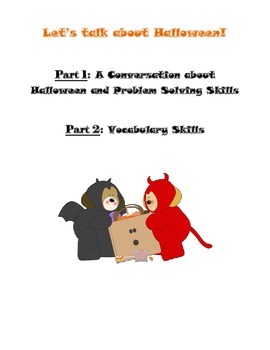 Halloween Conversation Skills and Vocabulary Skills Pack Print and Go! This is a 2 part lesson plan for Halloween. Best used for 2nd-High School Students. Part 1: A Conversation about Halloween and Problem Solving Skills. First, students ask their peer(s) about Halloween using the questions provided. 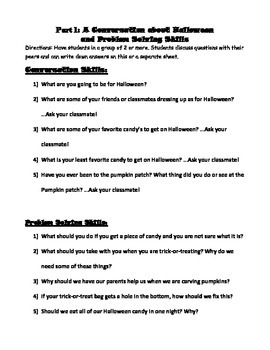 Then students can work together or individually to problem solve some Halloween scenario's. Part 2: Vocabulary Skills. Stuents increase their vocabulary skills by answering questions on their own and then they can discuss in a group.